First impressions of the PHOOZY, the world’s first integrated thermal, drop and float protection for smartphones. Fact: Several hours spent in a treestand with air temps in the single digits can rob your phone of battery power and leave you unable to call for help in case of an emergency. Not good. Likewise, summer days spent soaking up the sun on the beach or in a boat can be tough on smartphones, causing higher battery consumption and overheating. To solve these problems, meet the PHOOZY Thermal Capsule, the world's first solution to shield smartphones from the most challenging environments on earth. Having your phone overheat and shut down — or sink to the bottom of a lake or river — is a sure way to ruin a great fishing adventure. PHOOZY offers the peace of mind of integrated drop protection and buoyancy — meaning this capsule floats, keeping the phone at the surface of the water. Left: 5 minutes in the sun (85 degree air temp) without a PHOOZY. Right, 5 minutes in the sun (85 degree air temp) with a PHOOZY. Class dismissed. The PHOOZY Thermal Capsule is a thin, flat case that keeps smartphones from getting too hot in the sun while prolonging battery life in extreme heat and cold. How is this possible? After all, it can’t be rocket science, right? Wrong. The PHOOZY is adapted from spacesuit technology designed to protect astronauts from the extreme temperatures of space. 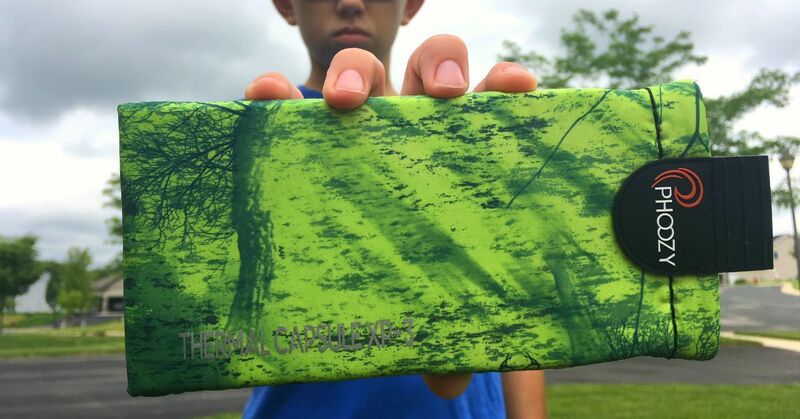 The case’s slim design easily slides in and out of pockets, and PHOOZY's proprietary Chromium-infused material in its outer shell reflects more than 90 percent of the sun's energy. Beneath the ultra-lightweight shell, a complex matrix of layered materials guard a smartphone from liquids, sand, mud and snow. The case’s Impactor Core delivers military-grade (810G 516.6) impact resistance and buoyancy without affecting Bluetooth or cellular signals. In other words, the PHOOZY is as smart as your smartphone. I recently unboxed a PHOOZY XP3 Series case and plan to use it immediately with my iPhone SE. As you can see from the photo at the top of this page, I didn’t choose the Realtree EDGE camo model (left), although I must admit it looks great. Instead, I went with the Mahi Green model that’s part of the Realtree Fishing series. My plan is to use the PHOOZY on the lake this summer, and I don’t want to lose my phone in the forest during fall hunting season, either, so I like colors that stand out. My first impressions of the XP3 are all positive. My iPhone slides into the case easily, and the hook-and-loop closure system (think Velcro) works well. I like the multi-point attachment system on the back of the XP3; it should work well with a belt or anytime I want to snap a carabiner to the XP3 for securing it to a backpack. Finally, I often leave my wallet at home but grab my driver’s license, fishing/hunting license and a credit card, and the XP3’s internal stash pocket (right) will be perfect for this application. For $49.99, I think the PHOOZY XP3 is a good value. My iPhone isn’t cheap, so giving it the protection it deserves seems like a good investment.